A colony of bats have moved into a new home - the body of a fibre-glass triceratops. The giant skeleton of a diplodocus normally housed in the Natural History Museum in London is moving to Dorset for an extended holiday. A full-size replica of a dinosaur has gone on show in Bristol. The model will be on display at the Wills Memorial Building. 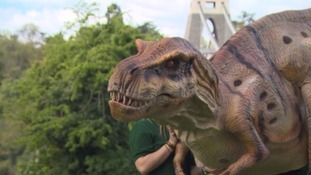 A display of animatronic dinosaurs at Bristol Zoo is to be extended due to its popularity. Visitor figures in July were the highest for a decade, with more than two hundred thousand visitors. The exhibition has now been extended to November 4th. Did dinosaurs grow old gracefully?